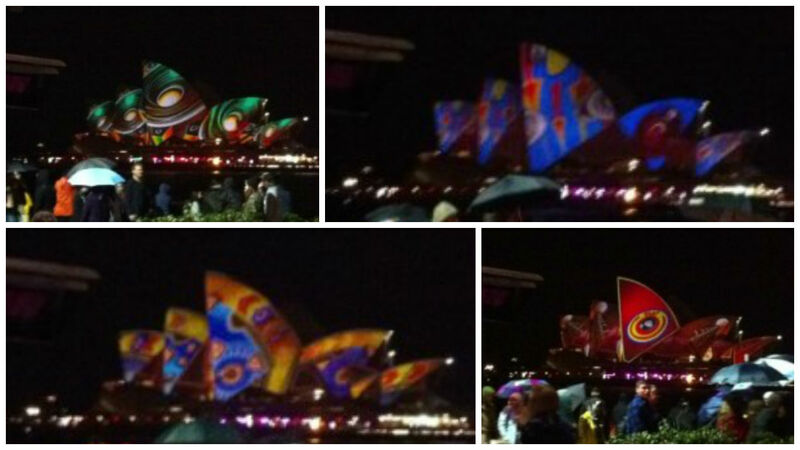 In from late May to 10th June 2013, Sydney has turned on the lights for the Vivid Festival. At night the cityscape lights up using the buildings as the canvas. The most popular location is the main ferry harbour of Sydney, Circular Quay. Any visitor to Sydney is likely to visit the Quay during the day to take ferries all over the city and get up close and person with the Opera House. But during Vivid it also offers a lot more for Sydney-siders and travellers alike at night. The whole Quay comes to life with projections of artwork on to many of the buildings. The Opera house is an obvious one, but there are also projections on to the train station, the “toaster” building, the Museum of Modern Art and a number of the older heritage listed buildings around The Rocks area. Circular Quay is normally brimming with life any night of the week, but with the addition of the Vivid Festival, the bars and streets are full with smiling family faces and people appreciating this free event. The bright side is that Circular Quay is so large, that the place doesn’t seem overcrowded. If you’re thinking of visiting Sydney over the next few and hadn’t quite made up your mind on whether to do it, or what dates to come, make sure you do it before May 10th and you’ll get one o the best free shows Sydney has to offer.